AMSTERDAM--(BUSINESS WIRE)--Mar. 21, 2019-- Tommy Hilfiger, which is owned by PVH Corp. [NYSE: PVH], is pleased to announce that year two applications for the Tommy HilfigerFashion Frontier Challenge are now open. The global program aims to support entrepreneurial start-up and scale-up stage businesses developing solutions that promote inclusive and positive change in fashion. After a successful first year, the company is excited to continue to work on identifying opportunities that support the advancement of the fashion industry. Interested businesses are invited to submit project proposals that focus on inclusive fashion. 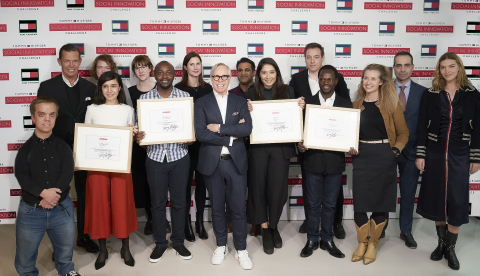 Over a multi-stage four-month process, applicants will be narrowed down to six finalists who will be invited to develop their project plans with the support of a team of dedicated Tommy Hilfiger subject-matter experts at the Campus of the Future in Amsterdam, the Netherlands. They will pitch their finalized concepts at the global Tommy HilfigerFashion Frontier Challenge Final Event in early 2020, where a prestigious jury panel will award €150,000 among two winners to support their ventures. The winners will also receive a year-long mentorship with Tommy Hilfiger’s experts globally as well as INSEAD experts, in addition to a place on the INSEAD Social Entrepreneurship Program (ISEP). An additional €10,000 will be awarded to the finalist who wins the “Audience Favorite Vote”. With a brand portfolio that includes TOMMY HILFIGERand TOMMY JEANS, Tommy Hilfiger is one of the world’s most recognized premium designer lifestyle groups. Its focus is designing and marketing high-quality men’s tailored clothing and sportswear, women’s collection apparel and sportswear, kidswear, denim collections, underwear (including robes, sleepwear and loungewear), footwear and accessories. Through select licensees, Tommy Hilfiger offers complementary lifestyle products such as eyewear, watches, fragrance, swimwear, socks, small leather goods, home goods and luggage. The TOMMY JEANS product line consists of jeanswear and footwear for men and women, accessories, and fragrance. Merchandise under the TOMMY HILFIGERand TOMMY JEANS brands is available to consumers worldwide through an extensive network of TOMMY HILFIGERand TOMMY JEANS retail stores, leading specialty and department stores, select online retailers, and at tommy.com. With a history going back over 135 years, PVH has excelled at growing brands and businesses with rich American heritages, becoming one of the largest apparel companies in the world. We have over 36,000 associates operating in over 40 countries and nearly $9 billion in annual revenues. We own the iconic CALVIN KLEIN, TOMMY HILFIGER, Van Heusen, IZOD, ARROW, Speedo*, Warner’s, Olgaand Geoffrey Beene brands, as well as the digital-centric True & Co.intimates brand, and market a variety of goods under these and other nationally and internationally known owned and licensed brands.